Could a wasp start a nest in a curtain? Jump Menu: Could a wasp start a nest in a curtain? Who deals with bumble bees? How can I tell if a wasp nest is active? I think I have mason bees, what should I do? I have bees nesting in my roof, what type of bee are they? Wasps build their nests in the weirdest of places, so it is entirely possible for a wasp to start making a nest in a curtain. We have dealt with nests in old boots, scarecrows, even one underneath a customer's bed. Take a look at the image in the link below; this was the nest under a bed. Who deals with bumble bees? We do not deal with bumble bees as they are a beneficial insect. You may find someone in your local beekeeping association who is prepared to come along and move them for you. Moving bumblebees should be done after dark when all of the bees have returned home. They can then be relocated and re-establish their bearings the next morning. 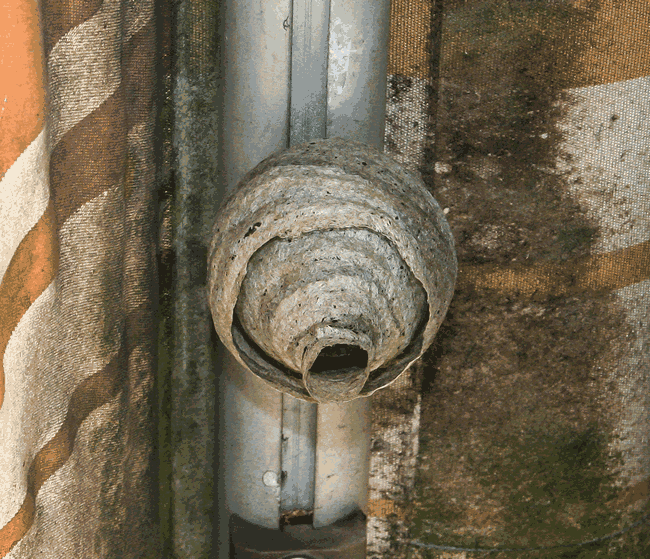 At certain times of the year, it can be difficult to know if a wasp nest is active or dead. In the spring; if the nest is larger than a football with no visible activity, the nest is probably an old one from a previous year. If it is golf ball size, it will need monitoring to see if a queen is in the process of building it. In the summer, if the nest is active, there will be activity on the outside of the nest and especially at the nest entrance. Wasps will be leaving and returning to the nest all day. In the winter, most nests die off in late autumn/early winter, and only huge nests with a good food supply nearby can last longer. If you are uncertain, please call for advice. I think I have mason bees, what should I do? Do not confuse Mason bees with wasps; they are very different although they look similar. Wasps are bald; bees are fluffy. If you have Mason bees, the first thing to note is that they are unlikely to sting you so no need to panic. Generally, if mason bees can burrow into the mortar of your brickwork, it is an indication the cement has become soft and needs repointing. Once repairs to the mortar are complete, the bees will disappear. Mason bees also like to use plastic weep vents used in modern houses, and they also tend to nest in cracks and crevices around PVC windows and doors. I have bees nesting in my roof, what type of bee are they? 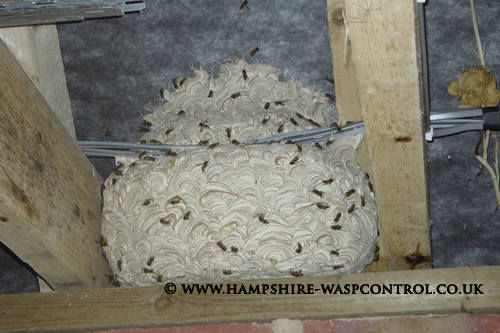 If you have bees nesting in your loft, to identify them, you need to look at how many you can see. Most bees nesting in attics are tree bumble bees, they are around half the size of a normal bumble bee but look the same, fluffy and black with a white bum. Generally, they tend to hang about at the entrance to the nest. A typical amount would number between 5 - 30 bees at any one time and are noticeably larger than wasps. If there are 100s of bees that look similar to wasps, then it is honey bees. Honey bees typically visually number in the hundreds at an established nest/hive. Swarm numbers are usually in the thousands. An entire colony of honey bees will number in the high thousands during peak summer.